Lean. Guerilla. Incremental. Vernacular. Tactical. These are all words Andrés Duany used to describe the “new New Urbanism” at the CNU-FL Statewide meeting this past week at the University of Miami. The room fell silent as people waited with bated breath to see what Duany—a founder, and arguably the most influential member of the Congress for the New Urbanism—would say this time. After all, it’s usually inspiring and challenging when he takes the podium and, as a man of opinionated flamboyance, it is, at the very least, entertaining and humorous. And what came next left me surprised and speechless, and with a greater love for New Urbanism: Andrés Duany fell on his sword. He acknowledged that five years ago, he had it made. People came to him and he always had the answers. He never acted in doubt, and he was confident that the answers lay in the principles that he, in part, had developed—namely, the SmartCode and Urban/Rural Transect, upon which New Urbanism had become structured in its 30-year history. With the shift in the economy, he took a year for study and reflection to determine the future of planning and New Urbanism. Duany identified two conditions that should dramatically shift the practice of all planners and urban designers: pervasive impoverishment and the psychological shifts of impending climate change. Duany learned that, on the other side of the economic downturn, or at least a good way through it, the future of New Urbanism was in the ability for the organization and its professionals to be adaptable, incremental, and minimal. In other words, he said, “An urbanist does the least necessary and lets everyone else naturally do the rest.” The result of the recession is what he calls “national impoverishment” and what many others call the “new normal.” People have less money, and that will not change, and even if it were to change, people will remain in a mental state of frugality. Therefore, if we are going to plan, we need to listen when people say “We don’t have any money” and figure out a way to make a difference for much less. Climate change has become a hot political topic, and most people who believe real science (if they do the math) will see that big events, including disasters, are inevitable. One member of the audience commented that America’s only hope is that the “Chinese choke themselves before we flood.” The meat behind that statement is that climate change is an international issue, and if even one country could have the cultural and technological shift to mitigate against resulting natural disasters, there would be 10 other countries that could not. Duany’s point was that one day soon, the majority of the people in our country will realize that climate change is impending, we won’t be able to mitigate our way out of it before the tipping point, and disasters will occur. The reaction will be to shift into survival mode. He described it as a “circling of the wagons” mentality. The most valuable trait in the planning profession will become adaption—we must start practicing it now to be relevant in the near future. These two factors—impoverishment and climate change—which Duany believes should shape the future of planning and urban design—specifically, new urbanism—can be addressed with tactical urbanism. Tactical urbanism is an urban design movement in which small and short-term actions lead to long-term change. This has been practiced all over the country by new urbanists (and many other urban designers and planners), most notably Mike Lydon, who wrote a two-volume guide on its implementation. Returning parking spots to parks, painting road intersections, and plastering the city with bumper stickers are all examples of how urban designers are taking back their city for the people. 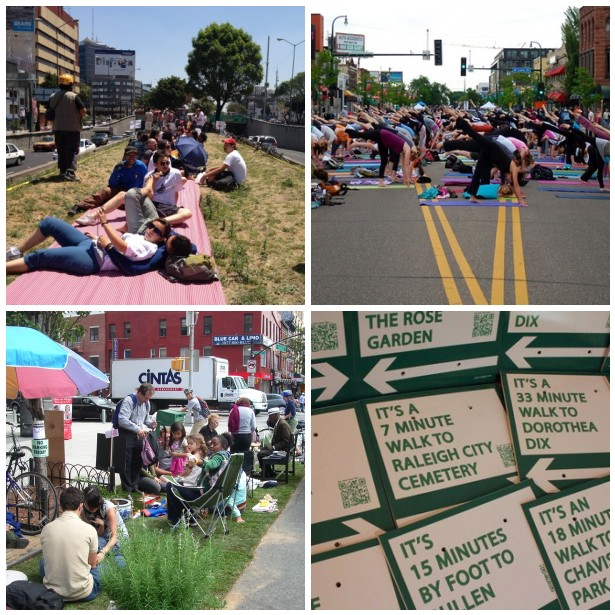 Examples of tactical urbanism across the country where people are taking back their public space. 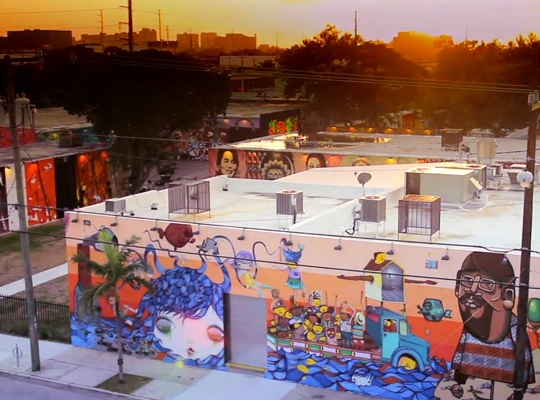 An example that Duany gave to show how small, incremental changes can transform a whole neighborhood is the Wynwood Arts District in Miami. The well-known developer, Tony Goldman, transformed an industrial area devoid of any activity or culture into a thriving neighborhood. With little investment, he painted the interiors of all the buildings white, asked talented graffiti artists to paint the outside, and filled the spaces between with a fine aggregate asphalt. He filled them with lighted chain-link fences and tractor tires as furniture. The industrial buildings become a perfect place for budding artists to exhibit their work. The result was that, over time, the real estate market followed, and it became one of the hottest places in town; adjacent development proved it. The neighborhood’s ability to redevelop through adaption with small incremental change is an example of how our industry must shift to address the changing priorities of the future planning profession. Let me be clear that Andrés Duany’s ideas are not revolutionary in and of themselves. Whether it’s tactical urbanism or pop-up urbanism, movements have been around for years that examine the exact same concepts. They haven’t always benefited from the recent notoriety and fame, however, but they’ve been around, which makes Duany look like he’s showing up a bit late to the party. Many critics of Duany might immediately comment on the fact that it is very convenient for the New Urbanist to change his tune after he’s gained his fortune, fame, and elite professional status. Fair point. However, from the inside, as someone who has a fair and balanced judgment of the CNU organization (after all, Duany is just one man,) the most exciting thing about his revelation and wishes for the future of New Urbanism is that they make the movement more relevant and applicable while, in turn, refuting its major criticisms. Personally, Duany’s comments made me more secure in my identification as a new urbanist. Truthfully, in the past, the criticisms of the movement that have irked me the most were based on what he created and defended. I’ve written about the criticisms of New Urbanism, but they are well known: over-priced products, green field developments, a traditional architecture rut, and a lack of understanding of the reality of retail. However, I was always able to rationalize or accept them for the greater good of the organization. CNU is made up of many great minds. It just happens that Duany and DPZ’s genius in Seaside and everything that came from it has always been the front man. If you read the CNU Charter—the very heart of the organization—it proclaims nothing but the benefits of traditional urbanism. And it is one of the few organizations that does that, and perhaps is the only one that does it with such conviction. Based on the facts, there has never been a discernible difference between new urbanism and good urbanism. However, by Duany proclaiming that his “heavy, armored brigade” idea of urbanism (i.e., the rules, guides, and strict formulas) has become irrelevant, he has immediately made New Urbanism more relevant to my beliefs as an urbanist. One might ask the question, Does this make CNU and New Urbanism as a whole irrelevant? My answer would be, absolutely not! First and foremost, the “heavy, armored brigade” did have its place within the movement, and that approach accomplished a lot by putting sustainable development on the map in a time when every developer was paving over the American countryside. Second, on many occasions, these rules are necessary and very beneficial. Proclaiming the benefits of traditional principles such as connectivity, legibility, and walkability will never become irrelevant. Third, it is from the CNU organization that a lot of these new ideas that Duany proclaims came to fruition. Lydon is currently one of the go-to experts of tactical urbanism, and the Next Gen CNU group is leading the way in how we design our cities today. People need to realize that New Urbanism has grown much larger than Andrés Duany, Elizabeth Plater-Zyberk, Ellen Dunham-Jones, Peter Calthorpe, Leon Krier, and James Howard Kunstler (to name a few of the greats) … it’s about us now. So, as Duany said, we now need to arm ourselves with our bumper stickers, t-shirts, picket signs, and burning bras and ensure that we continue to become relevant and adaptable to our changing profession and culture shift. And, finally, maybe some of the critics will be silenced ….